In England, his name was Anglicized to St Filbert. This day was just about the time, when the harvest for hazelnuts has traditionally begun in England (particularly Kent) as growers race to beat the squirrels to the nuts. 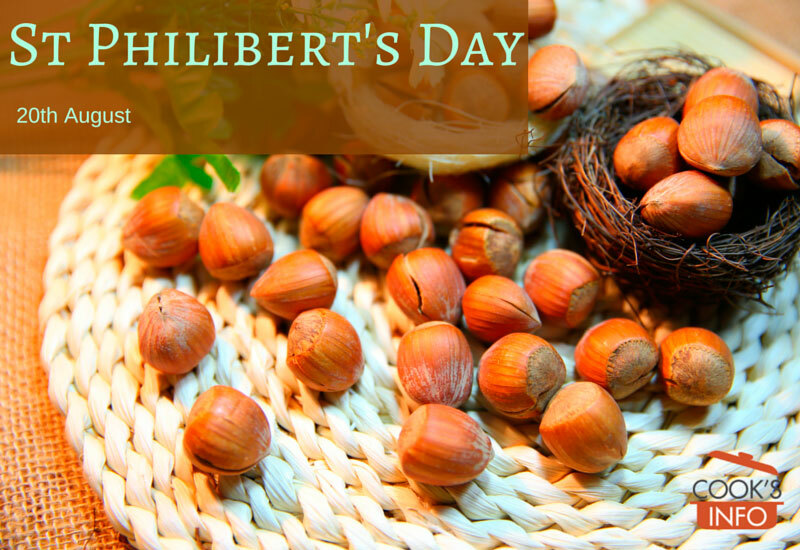 “The word ‘filbert’ is often said to be a contraction of ‘full-beard’, but more plausibly is an anglicisation of the Normal word ‘philibert’ (short for noix de philibert), from the time of their ripening on or about St Philibert’s Day. St Philibert was the founder and first Abbot of Jumièges, the greatest of the abbeys of Normandy, and his feast day is 20 August – which would of course, before the reform of the calendar, have fallen eleven days later in the season, at what is now the beginning of September.” Swift, Katherine. The Morville Hours: the story of a garden. London: Bloomsbury. 2011. Page 256. In Kent, England, Hazelnuts (aka Filberts) are called by “Cobb Nuts” or “Cobnuts” or “Kentish Cob”, even though they are not true cobnuts; they are indeed actually hazelnuts / filberts. 1. ↑ Swift, Katherine. The Morville Hours: the story of a garden. London: Bloomsbury. 2011. Page 256.